FS1 is advertising on NYC subways by calling the Knicks "Hopeless"
"Nothing will change until Dolan sells the team" is also used. The New York Knicks are either in shambles or have a unicorn of hope leading the way to greatness. That’s the argument playing out among New York Knicks fans and media members. Now, that appears to be the case on New York subways. Passengers using New York’s subway system between Times Square and Grand Central Station may have seen some advertising for the New York Knicks on their commute, which makes sense considering NBA season is just around the corner and the team plays blocks away in Madison Square Garden. The Knicks made some offseason moves, including trading Carmelo Anthony to the Oklahoma City Thunder. But closer inspection of the advertising plastered to the side of subway cars and inside on the seats of the train reveal this is not promotional material put out by the New York Knicks themselves. Instead, it is advertising for Fox Sports 1 focusing on the current mess of a situation the Knicks are embroiled in entering the new NBA season, that is the focus of their advertising. 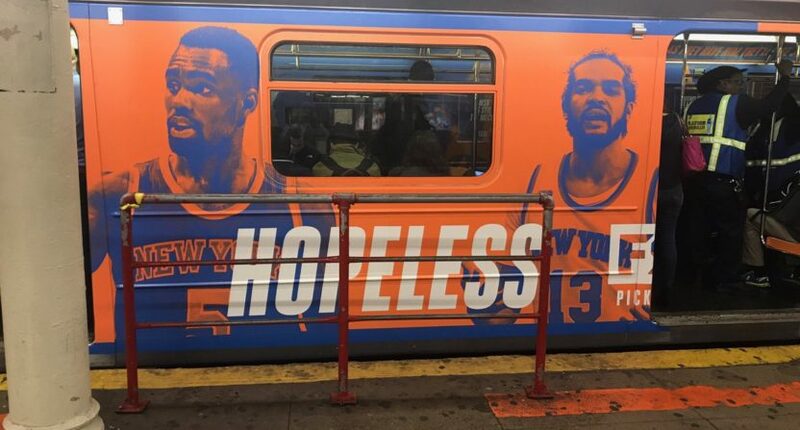 One subway car has images of Tim Hardaway Jr. and Joakim Noah with the word “Hopeless” popping out across the side of the train. To the casual eye, the message of this advertising may have been overlooked in the hustle and bustle that is seen around the NYC subway system. But even more subtle was the advertising seen inside the car, with player jerseys painted on some seats next to seats with messages that could easily be overlooked. The messages call out Knicks owner James Dolan and point out how long it has been since the last time the Knicks were truly relevant. It is clear the advertising campaign from FS1 is focusing on the mess of an organization the Knicks happen to be and hoping to lure in those Knicks fans looking for some company to commiserate with. And make no mistake about it, the Knicks will continue to be a talking point for all the wrong reasons as the NBA season plays out, and that makes for easy boiling point topics of conversation on the debate shows FS1 is known for. But because FS1 is all about debating the issues, the advertising campaign does have the alternate point of view to be fair and balanced, so to speak. The advertising campaign hits on all cylinders from what you would expect from FS1 by dwelling on the debating points that will hopefully engage viewers picking sides in the conversation. Except you would be hard-pressed to find any Knicks fans willing to take a positive spin with the franchise. These ads are largely just singing to the chorus, but perhaps that is goal here in an attempt to woo viewers to their network and other platforms. It is also worth pointing out one of FS1’s biggest rivals, Stephen A. Smith of ESPN’s First Take, is known for his Knicks fandom and hot takes. Maybe there is more to this campaign than initially perceived.